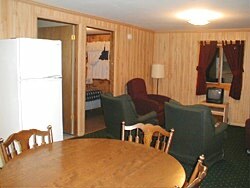 Our two room cozy log cabins have rustic charm & modern conveniences. Our cabins are similar to camping cabins only larger and with more comforts! The cabins accommodate a maximum of 4 guests. Our winter guests may feel more comfortable with just 3 persons to a cabin. They have a full size log bed, log bunk bed, bathroom & shower, a fridge, large microwave, toaster, coffee maker & outside gas grill. You also have a fire pit and picnic table. The bedding is provided, but you provide the towels, table service, and any cooking utensils you might want for the microwave or grill. One cabin is barrier free access & each cabin has a deck! There is not a TV in the 4 person cabins. OR, maybe you�d prefer the comfort & convenience of a “home away from home”! Our Little Lodge sleeps a maximum of 6 & is partially barrier free access. Besides a stove and fridge, there is a large microwave, 4 slice toaster, 12-cup coffee maker, tableservice.& cookware.You also have cable TV with HBO and a VCR. Your own private deck, picnic table & gas grill is included in your stay. PUT YOURSELVES IN OUR PLACE!! how much is your lodging for 2 or 3 nites?